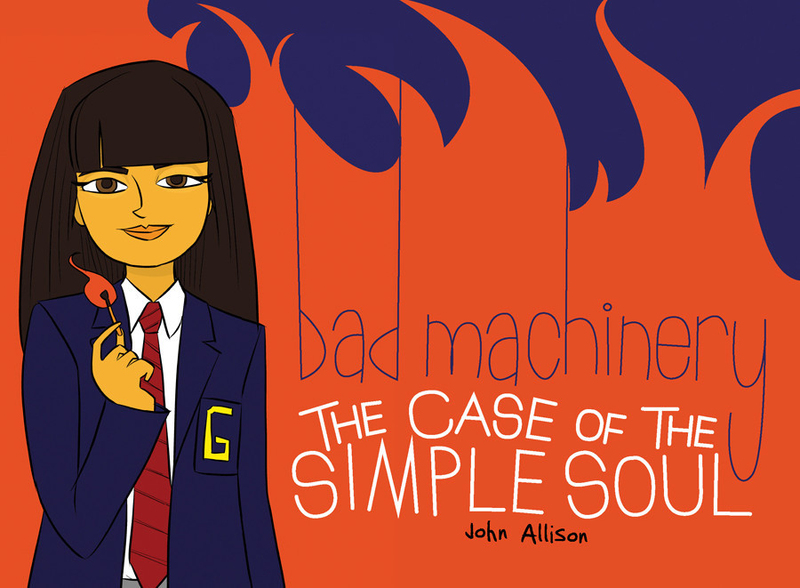 Despite being published by the American publisher Oni Press, Bad Machinery is a very British cartoon strip. Set in a fictional Yorkshire town it follows the day-to-day lives of a group of school kids who are out to solve mysteries. Those mysteries just may well involve monsters or other fantastical creatures, but not necessarily portrayed in a manner you’d expect. But predominantly, it’s about friendships, relationships, and finding out who you are, and it’s bloomin’ well funny too. I should make it clear that The Case Of The Simple Soul is the third book in the series and at this point I’ve not read the first two, but found it quite easy to settle into the book and pick up on who was who. The group dynamics, it seems have been somewhat altered by the romantic pairing of one of the boys and one of the girls, leaving the remaining kids kicking their heels in pairs. On the edge of town somebody is setting barns on fire. The two boys, Linton and Sonny, end up investigating this only to be tailed by a new lad, Colm, who shows an interest in what they’re doing. Meanwhile Shauna and Jack spot a barely clothed hulking figure sneaking about the countryside where it settles beneath a bridge. Shauna shares this information with Mildred and Charlotte and the latter two girls go to take a look for themselves, coming to the conclusion it’s a troll, the simple soul of the title. Is the troll responsible for the barn fires? Or is it the miscreant Colm who’s not afraid to do some petty shop lifting? It’s up to the friends to find out. I love John Allison’s cartooning throughout the book. He’s got a lovely way of engendering personalities and feelings through his drawings, and nothing feels too overblown or underdone. And the storytelling feels exactly right too, with a portrayal of young teens that doesn’t jar, what with their concerns of who is growing fastest, or simply through their everyday speech. The collective whole feels like it could have been your own childhood, when you were just trying to make sense of the world and pretty much anything was possible. Troll under the bridge? Why not! The fantastical element is so utterly underplayed as to appear quite normal, so the focus remains very much on the kids and their interactions with one another and the people of the town. It’s very well done, and I for one will be picking up the other books in the series. Bad Machinery is published as a webcomic first and foremost, with the collections following later, so if you really can’t wait, look up the website. Otherwise, you’ll find the books are well presented with a bit of extra top and tailing to add to the fun.